A Marston campaigner who has been lobbying Oxford City Council for five years to get lighting installed in a popular recreation ground said he was over the moon to finally have his wish granted. In 2007, Mick Haines started a petition to get the authority to put up lights along the path in Croft Road recreation ground, used by Marston residents use as a shortcut to the city centre, as the path emerges onto South Parks Road. After collecting more than 600 signatures from Marston residents, the scheme was given the green light in 2009 only to be held up as the council investigated how the lights might fit in with alternative schemes. 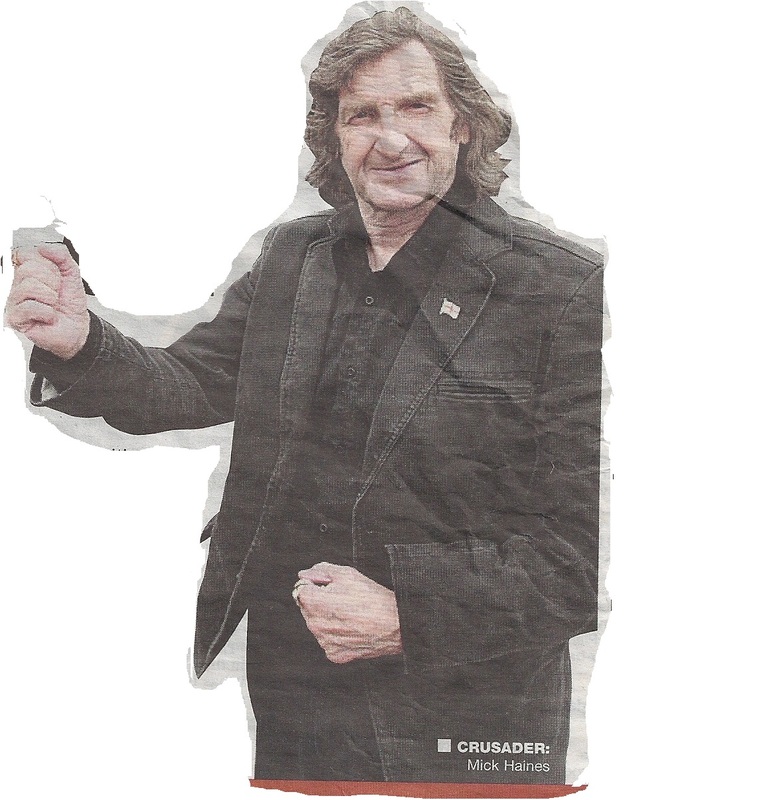 Mick continued to knock on the doors of houses in the area with his petition and in September 2010, he handed it over at 10 Downing Street with 1,205 signatures. He was advised by the Department for Communites to apply for the site to be granted a Green Flag award, which would have lead to greater investment in the area, only to find the park did not meet the criteria. But on Friday at a county council meeting at County Hall the £180,000 lighting scheme was given the go ahead, and is expected to be up and running by the end of the year. Mick said: “It’s been a long fight, five years, but we’ve got there in the end. It will be brilliant when the lights are up. The recreation ground is a pathway for a lot of people who cycle or walk through it on the way to work in the morning, but can’t cycle that back that way in the dark on the way home. As well as installing lighting columns, the scheme will also include widening, resurfacing and realigning the path which leads along Fairfax Avenue and Purcell Road. The lights are the latest victory for Mick, who also got the council to introduce a children’s play area and basketball courts to the recreation ground in 2006 after collecting 400 signatures to a petition. In reply to the letter “Passing buck over shop”, (Oxford Mail, February 22), I must agree with Mr MacAllister that in such difficult financial times that people will go for what they perceive as best value for money. It is freedom of choice that we, the local residents, are practising concerning local and moral issues. The increase in local traffic will add to an already-congested road with a dangerous bottleneck corner, where my niece was knocked down when coming home from school. There are frequent road accidents in this area. The road is especially dangerous for the old and young members of our community. The local Costcutter houses the Post Office which serves the community. It is not only a shop, it is a place where the staff know most of the locals by their first names and ask how people are if they don’t see them. It’s this personal, friendly and helpful service that adds to our sense of community and responsibility for everyone. The store proposed by Tesco will be an Express; this has a higher pricing system than a Tesco supermarket because it is deemed a convenience store. A uniformed approach to shopping, forced on us by the big corporate companies like Tesco, limits choice in the long run. It is morally necessary to limit a monopoly that will eliminate competition and dictate choices and prices for the future. 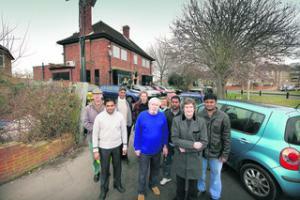 RESIDENTS in Marston have vowed to boycott a new Tesco store set to open in a former pub. Hundreds of people in the area, led by a local vicar, pledged to support the protest at a public meeting chaired by Oxford East MP Andrew Smith. Residents are concerned about the store’s impact on existing shops and increased traffic. It is set to open on the site of The Friar pub, but no date has been announced. The boycott idea was suggested by Rev Elaine Bardwell, of St Michael and All Angels Church in Marston Road. Nearly 200 Marston residents gathered in the Royal British Legion in Hadow Road to address concerns about the store. Marston campaigner Mick Haines, of Croft Road, said: “I think the whole area is unified on this issue. “The local shops have supported this area for so many years and Marston will be gridlocked by traffic. Planning permission was given by Government planning inspector Andrew Pykett last June despite a petition containing more than 4,400 signatures of objection. Oxfordshire County Council officer David Groves said under the terms of the planning permission Tesco would have to pay for road safety improvements. Mick Haines, I congratulate you for all your hard work that you do for the Marston community. It’s hard work and dedication, that’s what helping is all about. It’s not just to get praise, as many a time your petitions are ignored by the powers above. Yet you’re back on the streets helping others to help the people for their needs in important matters. It’s a pity there are not more people like you, Mick. Your reward may come this year. But I do know one thing. All over Oxford we will soon see councillors coming out of their closets and back on the streets, no matter what party they stand for. I myself have stood for election as an independent and for the Liberal Party. The choice was my own but only for a good reason. Trying to get something for the Wood Farm community. One of the issues that we were promised action on was Marywood House: a very large empty house in The Slade. It has stood empty for over 10 years. We were promised it would be demolished. It’s still there. Best of luck Mick, see you at the May elections count. DESPERATE stuff from Councillors Mary Clarkson and Beverley Hazell (Oxford Mail, January 18). I sense fear and desperation raising them from hibernation as election time draws near. Yes, I plead guilty to continually speaking to residents and gaining their opinions and support on the various petitions quoted. Petitions do count, as it’s the opinions of the people who sign them. A notable example: I raised a large petition against more traffic coming into Marston and, along with the Northway petition, this forced through a debate in the Town Hall. Over the subway, if the people in power had lent more weight to it, there may have been a different outcome. Instead, Labour actively did nothing. I am surprised that our councillors have thrown in the towel over Tesco’s, as I am initiating, organising and publicising a public meeting about it, with Andrew Smith MP chairing it. I am very pleased that the Scout Hall is up and running. My only concern at the time, as quoted in this newspaper (August 23, 2008), was the cost. Unfortunately, we have another winter without our lights in Croft Road recreation ground, so it can’t be used in these dark evenings. This is an important safety issue. One thing park users can be assured of is that I will not let this matter drop. WITH reference to the letter in the Oxford Mail on January 18 from Mary Clarkson and Beverley Hazell regarding Mick Haines. As a Marston resident, I know who I go to for any help and advice, and from my own experience Mick Haines is always ready to help. I’ve never seen Mary Clarkson or Beverley Hazell in this area and as for their comment on petitions, it’s a pity they are so often ignored. Mick Haines did not oppose the refurbishment of the Scout Hall, the query was a financial one. 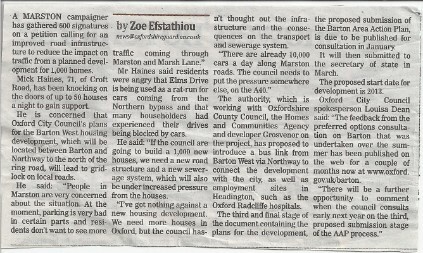 It’s a pity the Headington Subway petition failed, as the traffic is worse now in that area. Also, the Tesco application failed because the planning department approved the site for development by Tesco, which was against most of the local residents’ wishes. IT HAS taken five years and a trip to Downing Street but county transport chiefs have finally agreed to illuminate a small part of Oxford. 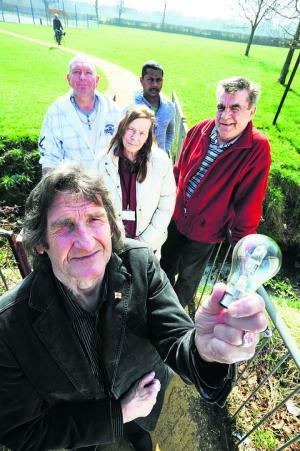 Marston residents have been campaigning since 2007 for lights to be installed at the Croft Road recreation ground. Community campaigner Mick Haines even took a petition to 10 Downing Street to raise awareness of the issue. Last night he said: “I am very pleased for everybody. Lots of people will be over the moon about this. “We were promised the lights in 2009 and it has been a hard fight over the years. The lights come as part of an Oxfordshire County Council scheme to invest more than £180,000 into the area. It will also include widening, resurfacing and realigning the path which leads along Fairfax Avenue and Purcell Road which according to the report is “difficult and uninviting to use, even for able-bodied pedestrians”. The path leads from Marston to the University Science Area along South Parks Road and ultimately to the centre of Oxford. As part of the work, the county council will also convert the route into a bridleway so it can be legally used by cyclists. Lighting columns will also be installed on the section of the route which runs through the recreation ground. A previous proposal for lights was thrown out in 2005 after some residents complained they were too close to their homes. County councillor Rodney Rose made the decision to go ahead with the scheme at his delegated decisions meeting on Thursday. He said there would be further discussions to make sure the lights did not disturb nearby residents. Purcell Road resident Peter Haarer spoke at the meeting. He said: “We are very concerned about noise late at night which is produced by people coming back from town. Marston residents are hoping to win their five-year battle for lights at a recreation ground this week. Oxfordshire County Council is set to agree to put lights in the Croft Road recreation ground as part of £185,000 upgrades to the area’s cycle path. Residents have been campaigning on the issue since 2007 to allow children to use the play area during the autumn and winter months. Marston resident Mick Haines has been at the centre of the campaign, even taking a petition signed by 1,205 people to 10 Downing Street in 2010. The Croft Road resident will speak at Thursday’s meeting, where a final decision will be made, to convince the council to go ahead with the lights. He said: “I am hoping they put those lights in. They could have gone in a long time ago, it has been too many years. “It is about safety for the youngsters and the old people who want to use it in the evenings. Councillor Rodney Rose, county council cabinet member for transport, will make a decision which will also cover improvements to the cycle path from Fairfax Avenue to Edgeway Road. County councillor Roy Darke, who represents the area, said: “I am hoping this will now go ahead and we will see something done over the summer. A proposal for £180,000 of lights was thrown out in 2005 after some residents complained they would be too close to their homes. The scheme would have seen lights put along the path by Rippington Drive, down Croft Road and along Purcell Road, although it sparked a legal wrangle over the ownership of a stretch of land behind Purcell Road. According to the meeting’s report, which recommends going ahead with the scheme, “lighting columns” could be installed through the recreation ground as well as widening and resurfacing the path. All sections of the route would also be converted to bridleways to allow cycling and horse riding. May I take this chance to thank Mary Clarkson and Beverley Hazel for inviting me to take part, as I did not see them on the day. THE meeting regarding Tesco on January 27 was very well attended (approximately more than 100 people) at the Marston British Legion, chaired by a very energetic Andrew Smith MP. Residents put across some very good questions to the panel over Tesco getting permission to build a metro store on the former Friar public house site. It was made clear there had been no public consultation between councillors and the residents and that an agreement appeared to have already been made behind closed doors. Consequently, a vote of no confidence was passed with our councillors involved in the application. The outcome of the meeting is that it will be three years before Tesco develops the site, which gives local businesses and residents time to prepare! Angry Marston residents have called for a boycott of the proposed Tesco Express due to open at the old Friars pub site on Old Marston Road. Following a public meeting on January 27, residents who have been petitioning against the new Tesco store carried a vote of no confidence in the handling of the matter by local councillors. More than 80 residents attended the meeting at the British Legion, in Hadow Road, which was chaired by Oxford East MP Andrew Smith, MP, and attended by David Groves, transport development control manager for Oxfordshire County Council, and Roy Darke, county councillor for Headington and Marston. The main issues raised by residents were road safety, traffic congestion and a lack of parking at the site. Many said they felt the area was well provided for with a nearby Co-op and Costcutter and that a new Tesco store would undermine the existing convenience stores, which could lead to residents not having access to Post Office facilities currently provided at Costcutter. The protection of the trees in front of The Friar were also a cause for concern, as they were planted on Armistice Day 1950 as a memorial to local people who had lost their lives in World War II. However, Cllr Darke said that it was highly unlikely residents would be able to prevent Tesco from opening a store at the site, after an independent planning inspectorate approved the application in June 2011. Cllr Darke said: “I think what swung it for the inspector is that there is now national planning guidance that says that in relation to retail provision, competition is a good thing. Cllr Darke, who said he would continue to use local stores rather than Tesco, said: “Someone at the meeting made the point that the only legitimate stance to take now is not to shop at Tesco. I am not sure if there is any real mileage in continuing to take action against the county council or Tesco. MARSTON’S one-man community campaign Mick Haines has vowed he “will never give up” as another year of petitions ends. The past 12 months has seen him galvanise support for trees, traffic solutions and street lights. 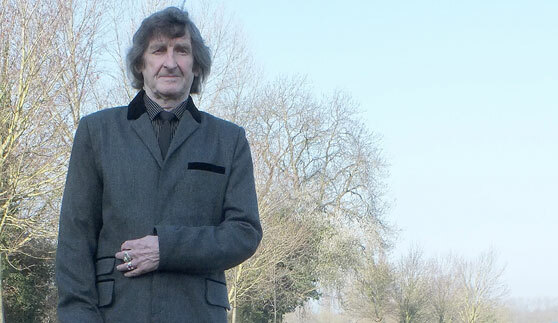 The retired scaffolder, who has lived in Marston for 40 years, began campaigning in 2004, when he was outraged by plans to put two sewage tanks under Croft Road recreation ground. His first petition gathered about 300 signatures. While the sewage tanks may have been installed, Thames Water did provide some temporary play equipment while the work was taking place. He said: “I do all this for Marston. The area has been left at the bottom of the pile. But what really got me going was when I heard about those tanks. “I am never going to stop campaigning. His latest campaign, calling for a solution to Marston’s traffic problems, was launched in October. With 954 signatures, Mr Haines delivered it to the Lord Mayor of Oxford last month. During his unsuccessful fight to stop Tesco developing the old Friar pub, the 71-year-old unearthed a forgotten piece of Marston history. Thanks to Mr Haines, it emerged some trees close to the pub were planted on Armistice Day in 1950 in memory of dead personnel. Since then he has been trying to make sure the trees are protected and their importance remembered. He said: “They were planted on Armistice Day for the people of Marston who died in the Second World War. One of his longest running campaigns will continue in 2012. His fight for streetlights at the Croft Road recreation park started in 2007 and has seen him take a petition of 1,000 signatures to Downing Street. He said: “We have got another winter now with no lights so none of the children can use it. It is a safety issue. One thing park users can be assured of is Mick Haines will not let the issue drop.